I switched from AT&T DSL about 12 months ago to U-Verse. 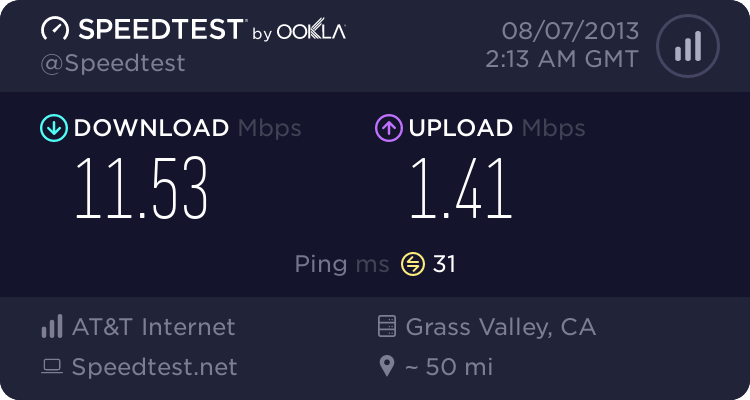 Ever since the change, I have been experiencing more and more latency and slower performance even though when I signed up for U-Verse I supposedly doubled my speed. 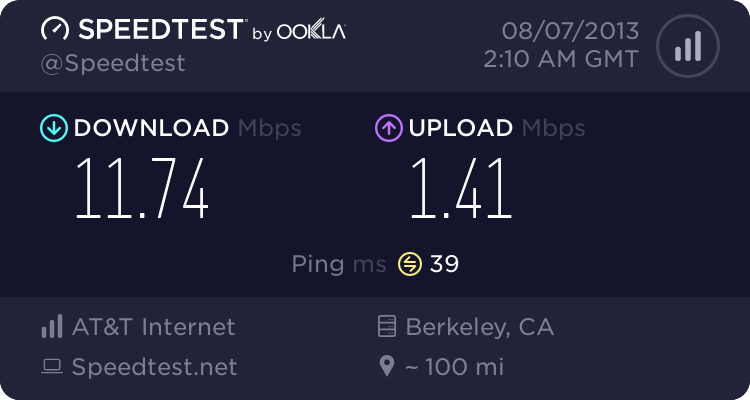 Speed test confirm that I am getting the Up / Down I am supposed to. But man, it does not feel like it. I have done the resents, the cashe dumping, everything I could. I am even now running my laptop directly conneted to the RG just to pick up a little better performance. I will be forever grateful if somebody can help me sort this out. I only have U-Verse internet. No TV. No phone. I have been running UV Realtime for a couple of days. A few items seem to be at issue. 1) Recommended Profile shows "no service"
2) Biloading shows a massive gap in the download. 3) Max Rate is at the low limit. That big dip is bridge tap and it is inside your house or apartment. The 3600 RG means you have VDSL from VRAD within 2200 feet, ideal service direct connect from m NID to RG, no going to other phone jacks. You need this addressed either by yourself or call for tech visit. I suspect this was a CSI (customer self install) where sync was delivered to NID and equipment was shipped to you for you to complete install. A tech visit would be a billable charge of $99, call 1-800-288-2020, have them run line test and they will schedule a four hour window for a tech dispatch. Yes. I already had DSL so the CSR that set me up with U-Verse said that they just ship and I set up. As far as teh Network Interface, I never touched it, wouldnt knwo where to start. However, the way this is set up is that several years ago we needed new line in room that has since become my office but has always been the location of our DSL RG. So, the NID is at the front of our home, the tech tapped off or tapped into the phone line in our kitchen, then ran a line outside of the home to another NID and back into my office. Is there anything obvious in the pictures of the wiring that I can correct myself? Note: We do not use the land lines for anything other than our U-Verse. Picture 3 - Is the NID on the other side of my office wall. Unscrew the top screw a bit, it will separate the two washers and allow the red & black wires to become loose. Remove the black wire, and retighten the screw with only the red wire attached. (Also to remain attached is the additional red wire on the crimped terminal, leave that one where it is). Unscrew the bottom screw a bit, it will separate the two washers and allow the green & yellow wires to become loose. Remove the yellow wire, and retighten the screw with only the green wire attached. (Also to remain attached is the additional green wire on the crimped terminal, leave that one where it is). Position the disconnected black and yellow wires where they don't touch anything. Go back inside and power up the RG. Give it a few minutes and see if it syncs up (both broadband and service lights should eventually go green). If it does, run UV Realtime and re-post the Bitloading tab and the IP/Profile tab. If the RG doesn't sync up within 10 minutes, then power it down. Repeat steps 1-7, swapping the black and yellow pair for the red and green pair. (i.e. the black will be connected to the top screw and the yellow to the bottom screw, and the red/green will be disconnected). One of those pairs is responsible for your bridge tap and disconnecting it will fix the problem. Thanks! The second configuration was the ticket (black / yellow). New Bitloading and IP/Profile shots attached. Bitloading looks more like it should but looks like there are still some issues in the IP/Profile. Yep, that got rid of the bridge tap. The power level I wouldn't worry about -- that is mostly due to your distance. The recommended profile applies mostly to people with IPTV service on a 3800/3801 modem ... with a 3600 and Internet only, the profile you have (13.2/1.5) is the correct one. Try some speed tests and latency tests ( www.speedtest.net, www.pingtest.net ) and see what the line looks like. Thank you again! I hope that getting rid of the bridge tap improves performance. Your numbers look good. The only way to continue testing now is to use the Internet for a few days and get a subjective "feel" for how you think it's working compared to how it felt previously. Thanks again for all of the help. I want to share one last tip for anyone who might be experiencing the same issues with latency and slow load time. After reading a bunch of different sites, there seemed to be a somewhat recurring comment about Internet Explorer having slow load issues. In my case I have been running IE7 on all four of my computers. Yesterday, I loaded Google Chrome on the two computers that exhibited the slow load / latency issue the worst,. Problem fixed. No Joke. Surfing load times match closely to teh examples that AT&T has on its demos. On the worst of the two, a laptop that is the farthest from the RG, the processor would kick on like a vacuum cleaner after a short stint of surfing. My wife has been using that laptop for about four hours today and the fan hasn't kick on once. Dump Internet Explorer. Do it now. I chose google Chrome as my test alternative, but, I probably wont do that on the other ones just because google wants to entagle itself with everything else. I will probably will try Firefox on at least one of the two remaining computers for comparison. Bluemach1 - Thanks for posting that you find Google Chrome an improvement over IE. I agree, over Safari. Firefox is pretty comparable to Chrome. If you can stand a little more Google - Change the DNS server to 8.8.8.8 (Google) to tweak Chrome even faster. I seem to remember thinking the page appeared before I took my finger off the button. Great tip. I will try this.